There are certain dishes that conjure up sweet memories of distant times. This little wonder, does it for my hubs. There is nothing complicated here…not at all. 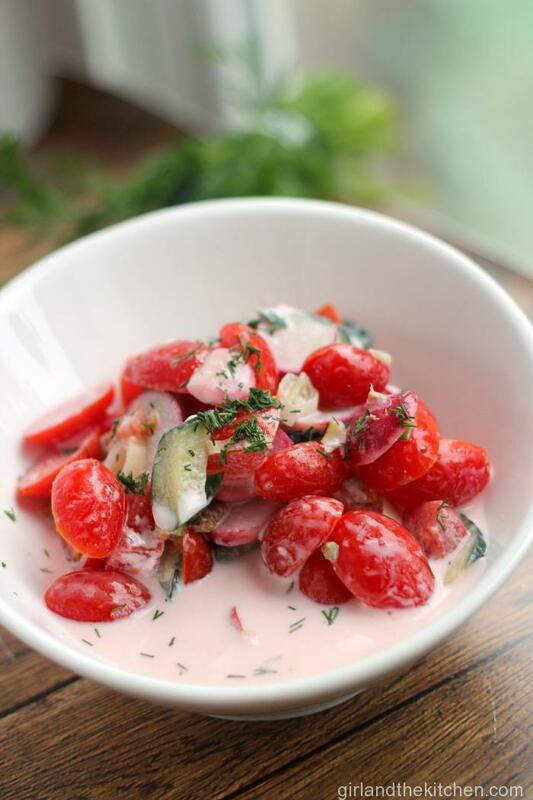 Some really fresh tomatoes, fragrant cucumbers, crisp radishes and some other ingredients are all tossed in a simple sour cream dressing. My mom used to make a similar salad without the sour cream dressing to go along many of our dishes, one of which were the famous Russian Home Fries. My husband introduced me to his love of this salad very early on in our relationship. I noticed whenever we ate at his parents house, this brightly colored salad was always present on the table. Everyone seemed to love it. But it wasn’t my mom’s salad that I had been so accustomed to for so many years. And if there is anything you know about me, I am not a fan of tasting foods that go against her recipes. And I did. Reluctantly at first. And hungrily soon after. It was for me what most food is that we grew up with. 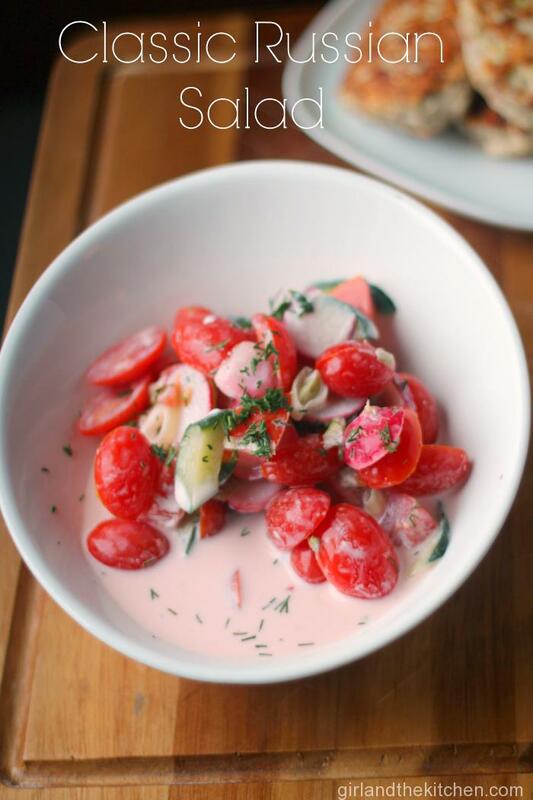 Simple, fresh flavors that make you remember home. Now when I make hubs any comfort food, it goes without saying that this will be on the table. It makes both of us happy campers. And the munchkin enjoys it as much as we do. I do recommend that the freshest tomatoes and cucumbers are used for this. I prefer to use either Roma tomatoes or little grape or cherry tomatoes as I have pictured because the flavor is just a bit sweeter than with regular tomatoes. Of course garden fresh is best As far as cucumbers go, I prefer either English cucumbers or those tiny Persian cucumber that tend to have a bit more crispy sweetness. If using Roma tomatoes, just cut them up into bite size pieces. Slice cucumbers in half lengthwise, then just chop them up. Slice the scallions thinly, you will be using both the white and the green of the scallion. Chop dill finely. Feel free to use more if you like dill a whole lot. Add all ingredients into a bowl and season with salt and pepper. In a separate bowl combine, sour cream and just a splash of water. You are doing this to thin out the sour cream so that it blends in the salad better. Just add enough so that it is a bit thinner, not water. Toss the veggies with the sour cream dressing. Taste and season as needed.